The giant looked down on the youth and despised him. LL THROUGH THE reign of Saul, there was constant war with the Philistines, who lived upon the lowlands west of Israel. At one time, when David was still with his sheep, a few years after he had been anointed by Samuel, the camps of the Philistines and the Israelites were set against each other on opposite sides of the valley of Elah. In the army of Israel were the three oldest brothers of David. "I am a Philistine, and you are servants of Saul. Now choose one of your men, and let him come out and fight with me. If I kill him; then you shall submit to us; and if he kills me, then we will give up to you. Come, now, send out your man!" "If any man will go out and kill this Philistine, the king will give him a great reward and a high rank; and the king's daughter shall be his wife." "Who is this man that speaks in this proud manner against the armies of the living God? Why does not some one go out and kill him?" "What are you doing here, leaving your sheep in the field? I know that you have come down just to see the battle." "If no one else will go, I will go out and fight with this enemy of the Lord's people." They brought David before King Saul. Some years had passed since Saul had met David, and he had grown from a boy to a man, so that Saul did not know him as the shepherd who had played on the harp before him in other days. "You cannot fight with this great giant. You are very young; and he is a man of war, trained from his youth." "I am only a shepherd, but I have fought with lions and bears, when they have tried to steal my sheep. And I am not afraid to fight with this Philistine." "I am not used to fighting with such weapons as these. Let me fight in my own way." So David took off Saul's armor. While everybody in the army had been looking on the giant with fear, David had been thinking out the best way for fighting him; and God had given to David a plan. 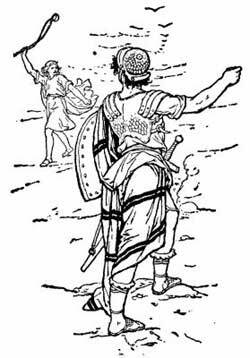 It was to throw the giant off his guard, by appearing weak and helpless; and while so far away that the giant could not reach him with sword or spear, to strike him down with a weapon which the giant would not expect and would not be prepared for. David took his shepherd's staff in his hand, as though that were to be his weapon. But out of sight, in a bag under his mantle, he had five smooth stones carefully chosen, and a sling,--the weapon that he knew how to use. Then he came out to meet the Philistine. The giant looked down on the youth and despised him, and laughed. "Am I a dog?" he said, "that this boy comes to me with a staff? I will give his body to the birds of the air, and the beasts of the field." "You come against me with a sword, and a spear, and a dart; but I come to you in the name of the Lord of hosts, the God of the armies of Israel. This day will the Lord give you into my hand. I will strike you down, and take off your head, and the host of the Philistines shall be dead bodies, to be eaten by the birds and the beasts; so that all may know that there is a God in Israel, and that He can save in other ways besides with sword and spear." While the two armies stood wondering, and scarcely knowing what had caused the giant to fall so suddenly, David ran forward, drew out the giant's own sword, and cut off his head. Then the Philistines knew that their great warrior in whom they trusted was dead. They turned to flee to their own land; and the Israelites followed after them, and killed them by the hundred and the thousand, even to the gates of their own city of Gath. So in that day David won a great victory and stood before all the land as the one who had saved his people from their enemies.